In our project PORT WORKERS – FROM DUSK TILL DAWN, we deal with the fact that the work situation in the municipal port of Münster has changed and is in a continuing process of change. 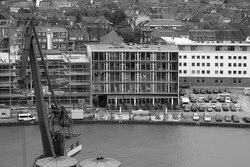 The port is no longer only a trading centre for goods, but also for ideas, and harbours many new professions. It is no longer the dock workers, but rather waiters and artists, advertising people, architects, publishers, technical professionals and many other who typify the image of the moment. All of them are the port workers of today. To represent the various professional groups, we have photographed selected individuals for the project PORT WORKERS. 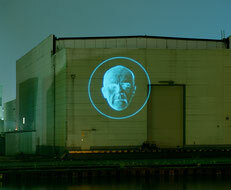 The resultant black-and-white portraits are projected in large scale onto suitable building surfaces in the port area in the night. These luminous images gradually materialise as it gets dark, then to shine through the night brightly but in their own way remotely like stars. With the dawn of day, they then withdraw from perception and disappear into the unknown. We were very glad of the wide approval which our project PORT WORKERS – FROM DUSK TILL DAWN has met with among the many businesses located in the port area. We thank our sponsors, whose commitment helped make it possible to realise the project. And we thank the 22 port workers for their trust in permitting us to portrait them. The beautiful is an appearance of temporal reality. In the uncompromising delineation of the image matrix of the city of Münster, the inner port at the edge of the city centre marks significant coordinates. Ten years ago the residents of the city were largely unaware of it or avoided it, considering it to be only a decrepit district on the outskirts, but since the turn of the millennium this compact quarter has advanced to become a choice piece for urban planning and commercial interests. Even though the verbal effusiveness of the pioneering days, for example talk of the “creative quay”, has been happily overcome, this display-case quarter remains at odds with itself. On the one hand, it manifests the seemingly inevitable urban arrangement of a fast-moving leisure-time hedonism staged on the sentimental backdrop of storehouses that have been renovated to the core, of pseudo-modernist office and creativity areas as well as an oversupply of trendy test-tube restaurants interspersed with vacant lots in controlled decay. On the other hand, the area is eyed by neighbours and outside business people with indignant suspicion. But it is precisely the sustained ambivalence of categorical rejection and alarming affirmation that gives the port the potential to be a point of identification for the city’s recent history. Within the context of the planned, politically initiated specification of municipal identity, the Westphalian centre Münster is straining towards an appealing and enduring image which, in contrast to the well loved historicised surrogates in the city centre, is intended to make the structural change that is just beginning or impending emotionally graspable and to manifest it emblematically. It is obvious that such processes of radical change take place differently in Münster, populated by civil servants and students, than in the neighbouring Ruhr industrial region. The current model solutions then seem all the more astounding: according to the observer’s standpoint, they are in danger of turning into the opposite of what was intended, and the negative image of the stage or flow-through town reaches its culmination in the new old port. In particular, the emotional and conceptual fuzziness of this complex, vacillating between low cultural half-life, friendly consumption and symbolical capital, constitutes the point of departure for the poetic rupture made by the project “Port Workers – From Dusk Till Dawn“. The warning index finger agreeably remains down: at a remove from an unproductive lamentation and despair of culture, the point here is to explore aesthetic and social potentials provided by the dominant givens. Thus, in a predefined timeframe, deliberately selected parts of the municipal port are put on exhibit with projected images. Alternating by the minute in a uniform procedure, negative tondo portraits of twenty-two different people with a specific affinity to the port context are profected as luminous images optimised for distance viewing. Only the size and ground of the projections change depending on the painting procedures and the motivating questions underlying the development of the works. From the first twilight to dawn, the black-and-white protagonists are assimilated to the ground on which they appear in an play of varying light intensities ranging from volatility to solidification, or they are draped over their surfaces as ornaments. The persons portrayed are themselves physiognomically reduced like icons: the result is that the images are unpretentiously stylised to yield a foil for generalised identification, representatives as it were, inasmuch as individual stories remain untold. Where the projections are spotlighted for the promenading passers-by every evening, they bring us to rest in the image in a puzzling way, acting without an authoritarian manner to hone the eye for the familiar and animating us to discover from unexpected perspectives the yet unknown in what up to now we believed to be well known. This is a pleasurable enterprise, one that goes hand in hand with a certain futility inasmuch as time eventually catches up with this deceleration and the aura of its images. The consequence is that the impression of an inevitable transitoriness grows, one that shows itself outwardly in a seismographic shining forth that fraternises with the medium of the image for the one unstable moment between glowing and fading, then to die away naturally in the rhythm of the transition from night to day. What remains is an imaginary after-image: the sediment of the projection whose diffuse echo reverberates in the observers’ heads. On 11 August 1899, the Dortmund-Ems Canal was officially opened. The centuries-old idea of a navigable waterway linking Westphalia with the North Sea had become a reality embodied in the 282-kilometre-long canal. At first, it was not a link between already existing waterways, but exclusively a waterway for transportation from the Dortmund industrial region past Münster to the North Sea. Later, the south portion of the Dortmund-Ems Canal became an important part of the water link between the Rhine and the Weser Rivers. On 15 and 16 October 1899 the Münster port was opened. The decisive factors for the choice of the site of the port were the proximity to the city and the good connection to the railway. The length of the port basin, which branches from the canal, was about 740 metres, the mean width 58 metres. Tracks for the steam-powered crane were directly on the waterfront. On the north bank, the city erected a large three-storey warehouse; directly adjacent to it were an open storage hall and the impressive port administration building. Buildings for municipal supply and service authorities such as the electricity and the gas works were located on the street Albersloher Weg. Shortly after the opening of the port, numerous businesses established premises in the port area with extensive storage, operating and production facilities. At the bridge taking the Albersloher Weg over the canal, a private port was established in 1901 belonging to the Peters shipping company; it was taken over by the city of Münster in 1913. The port of Münster was primarily an incoming port for agricultural and forestry products. Before the First World War, Münster was the second most important grain transhipment facility in north-west Germany after Duisburg. From the 1930s on, construction materials were shipped through the port of Münster in increasing quantities. They were required primarily for the numerous military construction projects in connection with the armament of the Third Reich. The Second World War began in 1939 with the invasion of Poland by the German Reich. The population of Münster quickly felt the repercussions of the war: Münster was targeted by a total of 112 bombing attacks. The first attacks on Münster in 1940 to 1942 primarily targeted the transportation and business facilities, including the port area. The most significant destruction took place in the last seven months of the war with more than 50 percent of the overall quantity of bombs dropped on the city during the air war. Although from the beginning of the war on, freight shipment through the port decreased continuously, in 1944 it was still over 250,000 tonnes. The maintenance of freight shipment of this magnitude was probably only possible because municipal facilities and many businesses in the port made considerable use of prisoners of war and alien labour to work in production and to clear up after bombing attacks. At the end of the war, the port facilities of Münster had been largely destroyed, but on 2 March 1946, the docks and escarpments as well as four cranes, an exhaustor and an elevator were already in a sufficient state of repair to resume operations at the municipal port. In 1946, shiploads amounting to more than 145,000 tonnes were shipped through the port; of this amount only 220 tonnes were outgoing. Almost 80 percent of the incoming goods consisted of construction materials for reconstruction. Aside from slight fluctuations, the years following the Second World War were characterised by a steady growth that reached its climax in 1962. In that year, almost 4300 ships entered the port of Münster – a maximum that has never since been reached. 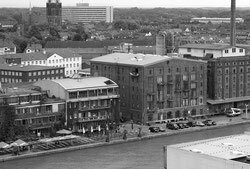 From the mid-1960s until now, the municipal port of Münster has steadily lost significance. In 2005, only 281 boats were registered entering the port. A comparison between incoming and outgoing goods makes it clear that the port of Münster was from the very beginning primarily a port for incoming goods. Since the middle of the 1960s, the area around the municipal port of Münster has become a commercial and industrial district with little attraction. In recent years, however, an extensive restoration and renovation of the port area has been undertaken. The north part on the Hafenweg (port road) is intended for the arts and culture scene, the south area, by contrast, for industrial establishments. The creation of new living quarters is not projected in the construction plans. On the port road, the aim is not to tear down the old buildings that survived the Second Word War, some of which were erected around 1900, but rather to restore and maintain them.